The 46th Annual Fort Myers Boat Show, Southwest Florida’s Premier Boating Showcase, is set for Nov. 15-18, 2018 running Thursday through Sunday. Downtown on the Caloosahatchee, in the heart of the “River District”, it’s the perfect setting for a show. 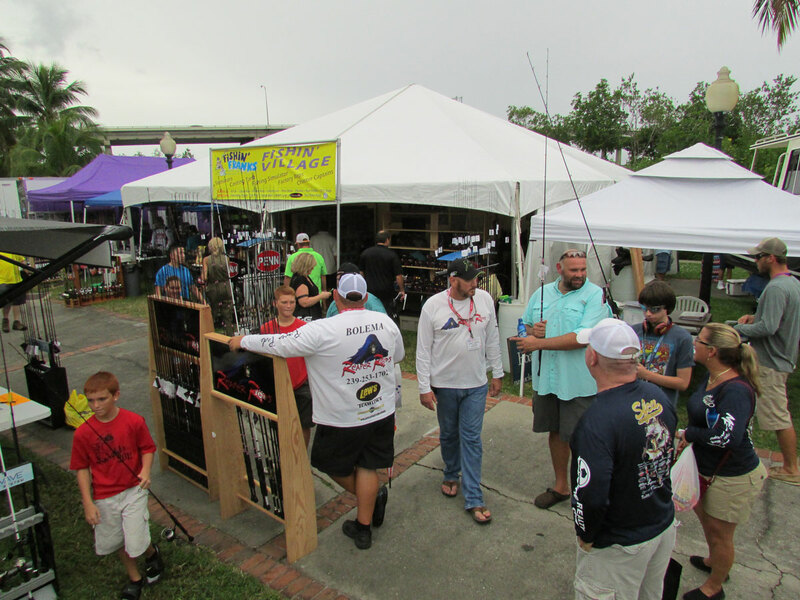 With a booming marine industry along with redevelopment in the downtown area, the show’s redesigned and expanded layout features more boats, products, and services than ever. As Mainsail Lodging & Development renovates the Harborside Event Center and builds an adjoining hotel, the show’s entrance has shifted to the west end of Centennial Park. Entering at First St. & Carson St. (next to Joe’s Crab Shack), show goers enjoy attractive displays along the river stretching from Centennial Park through Downtown along Edwards Dr. to the City Yacht Basin. With plenty of accessible parking in the large grass lot at First St. & Altamont Ave. (next to Publix), the show is very consumer and family friendly. Southwest Florida features a wide array of waters from back country flats, bays, rivers, and estuaries to the Gulf of Mexico. With such a diverse boating market, there are a variety of boat types on display including jet skis, skiffs, bay boats, flats boats, center consoles, pontoon boats, deck boats, cruising boats, sport fishers, and more. To accommodate an increasing demand in the market, the show and the Southwest Florida Marine Industries Association have made a substantial investment in floating docks & equipment which make for more impressive in water displays at the City Yacht Basin. 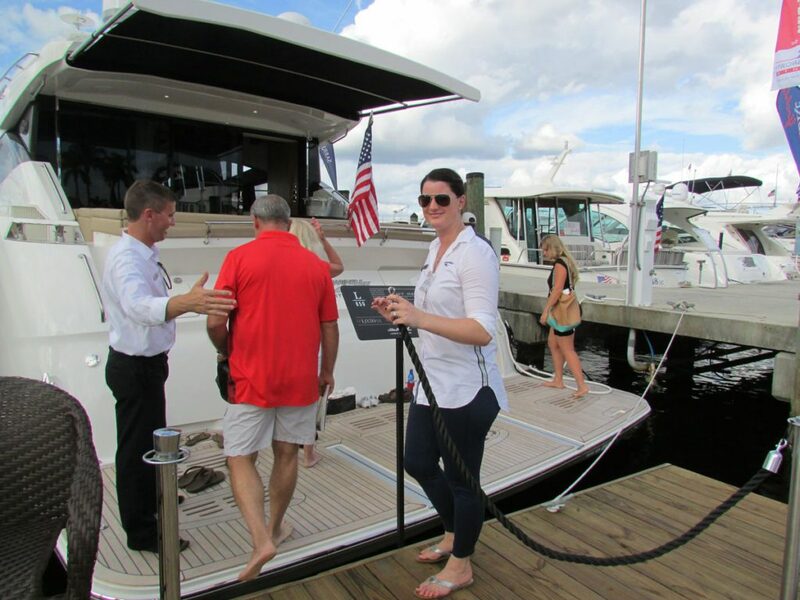 In addition to boats, you will find the largest display of accessory items and marine services of any Boat Show on Florida’s west coast including electronic equipment, motors, boat lifts, docks, clothing and more. Fishin’ Frank and his crew continue to make a splash with an expanded “Fishin’ Frank’s Fishin’ Village”. Highlights include tackle displays with factory representatives on hand, a seminar area with local charter captains, show specials with factory pricing, and Frank’s popular fishing simulator giving guests a chance to catch anything from a Largemouth Bass to a Marlin. The Fort Myers Boat Show runs Thursday, Nov. 15 through Sunday, Nov. 18. Hours are Thursday, Friday, Saturday from 10 a.m. to 6 p.m. and Sunday from 10 a.m. to 5 p.m. Admission is $12 per person at the gate, and children younger than 16 are free with a paid adult admission. Parking is just $5 in the grass lot at First St. & Altamont Ave. (next to Publix) and includes a short trolley ride to the entrance. Hours: 10 AM - 6 PM Thurs. - Sat. / 10 AM - 5 PM Sun. $10 TICKETS WON’T LAST LONG! Snag the lowest price during online pre-sale. Skip the line this year! $10 ONLINE TICKETS WON’T LAST LONG! The most convenient show parking for both exhibitors and show guests is in the large grass lot at First Street & Altamont Ave., next to Publix. This is $5 per car each day and includes a short trolley ride to the entrance. The trolley will begin service for exhibitors 2 hours prior to show opening each day and will have multiple stops prior to show opening to help exhibitors to get as close as possible to their displays. The shuttle will provide service until one hour before the show closure each day. There is additional parking available at the Main Street Parking Garage (Main Street & Jackson Street) and the Edison Garage (Monroe Street & Bay Street). Formula Formula Boats South, Inc.
Mercury Inflatables Formula Boats South, Inc.
Young Boats Young Boats, Inc.
Where is the boat show? The Boat Show is located in downtown Fort Myers and there are some changes this year. The Harborside Event Center is closed for renovation and an adjoining beautiful new hotel is under construction. Fortunately, we have been able to redesign a portion of our layout to accommodate our exhibitors and to create a great new look. The main entrance will now be off of West First Street at the West end of Centennial Park next to Joe’s Crab Shack. Exhibits will wind through the park and Edwards Drive east to the in-water displays at the Fort Myers City Yacht Basin. What are the dates and hours? From I-75, take Exit 138 (MLK Boulevard). Head west into downtown (about four miles). From U.S. 41: If you are coming from the south, watch for signs leading you into downtown just before crossing the river. From the north, take the first exit over the river and head east on First Street. Once in the downtown area, there are several cross streets that lead to the show, between Lee Street and Monroe Street. There is a large lot available for show parking less than ½ mile from the show entrance at just $5 a car. It is located west of the show between McGregor Blvd. and First Street at Altamonte Avenue (next to Publix). There will be free trolley service from this lot to the show entrance, making this easily the most convenient place to park. The Edison Parking Garage, about three blocks from the show, is on Monroe Street between First Street and Bay Street. There is parking in the Jackson Street Garage (Jackson and Main). This is only two blocks from the show entrance at the Yacht Basin and Lee Street. How much does it cost and where do I enter the show? Admission is $12.00 per person at the gate. Children under 16 are free with paid adult admission. It is fast and convenient to buy tickets at the main show entrance (off 1st Street at the west end of Centennial Park) or at the Marina Entrance (Lee Street and Edwards Drive). What kind of boats will I find? This is one of the most complete display of boats on Florida’s west coast. On land and in-water, visitors will see everything from bay boats to new and used luxury yachts. You will find a variety of inshore and offshore fishing boats, custom skiffs, pontoon and deck boats and virtually every type of boat to enjoy your time on the water. What if I already own a boat? This is far more than just a display of boats. We have the largest display of accessory items of any Boat Show on Florida’s West coast including displays of electronic equipment, motors, fishing equipment, accessories and other items from manufacturers all over the world. Plus you will find a wide variety of service companies, marinas and shipyards and educational information to help you get the most out of your time on the water. What if I don’t own a boat? Are there other items? There will be one-of-a-kind products such as apparel, sun glasses and boat shoes or you can plan your next fishing trip by obtaining information on resorts and marinas. And, with nautical clothing and gift items, this is a great chance to kick start your holiday shopping for your family and friends who enjoy the boating lifestyle. You sure do not want to miss our expanded Fishing Village and Tackle Show with Seminars, tackle displays, fishing simulators, casting ponds and many fishing experts who will be on hand to answer questions and just talk fishing. There will be a Boat Maintenance Area, manned by the Ft. Myers Technical College who can answer questions on motor repair, electronics, and just about every regular maintenance tasks you may be trying to tackle. The U.S. Coast Guard Auxiliary, U.S. Power Squadron, Lee County Marine Task Force and Homeland Security will all have displays and can answer a wide range of questions on boating safety, boating regulations, and help you enjoy your time on the water. Do you have food and drinks? 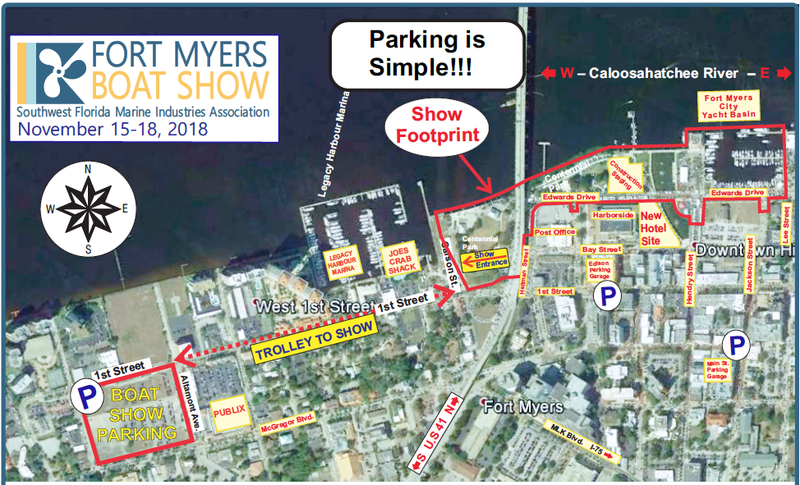 There are a wide variety of food and drinks available in this year’s show with terrific dining areas to enjoy the views of Downtown Ft. Myers along the Caloosahatchee River. The “Yacht Basin Pub” overlooks the beautiful new basin and features great food items as well as cold beer, wine and cocktails. There are many great restaurants within an easy walk of the show. If you have not been in Downtown Ft. Myers lately you will be surprised at how the area has come alive. Along with your paid admission will be a coupon for a “buy one get one free” drink at several of those restaurants. We are pet lovers but given the scope of the show and insurance / liability issues, we cannot allow pets. Who puts on this show? 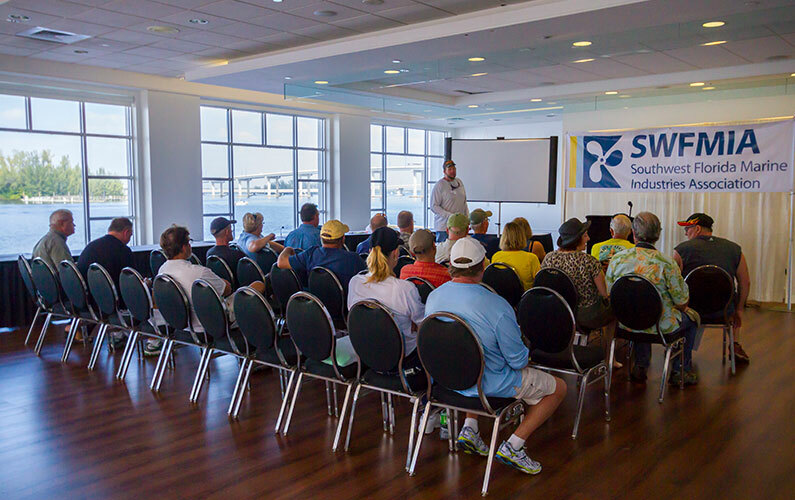 The Fort Myers Boat Show is owned by the Southwest Florida Marine Industries Association. The association, whose membership includes virtually every boat dealer and marine related company in Southwest Florida, has protected the rights of boaters and promoted boating and the marine industry in Southwest Florida for more than 40 years. The association also owns the Bonita Springs Boat Show, held at the Naples Ft. Myers Greyhound Track in March and the Charlotte County Boat Show, held at the Charlotte County Fairgrounds in January. Fishin’ Frank and his crew are back with a series of informative seminars, all taking place in the Fishin’ Village in Centennial Park. Stop by the Village throughout the show to talk with area charter Captains and local fishing experts. In Centennial Park, “Fishin’ Frank’s Fishin’ Village” is its own mini-fishing show. There will be tackle displays with many factory reps on hand, a seminar area with local charter captains talking about inshore and offshore fishing, a casting tank, and the popular fishing simulator which gives visitors a chance for a virtual battle with everything from bass to marlin. 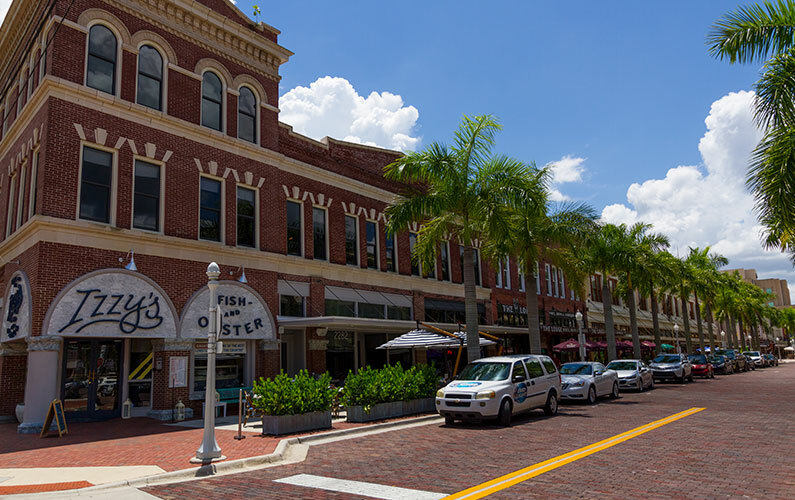 If you haven’t visited downtown Ft. Myers lately, you’ll be surprised at how the area has come alive. There are many restaurants within a very easy walk of the show. Whether you’re looking for Italian, sushi, casual or fine dining, you’ll find it right nearby. For a list of restaurants in the downtown Fort Myers area, click here. The Fort Myers Boat Show is owned by the Southwest Florida Marine Industries Association. The association, whose membership includes virtually every boat dealer and marine related company in Southwest Florida, has protected the rights of boaters and promoted boating and the marine industry in Southwest Florida for more than 40 years. The association also owns the Bonita Springs Boat Show held at the Naples Ft. Myers Greyhound Track in March, and the Charlotte County Boat Show, held at the Charlotte County Fairgrounds in January.